Settling in Maine does not mean giving up the prospect of a high-powered career. Not everyone wants to punch a time clock or work in an office. Looking for jobs off the beaten path, Charlotte Albright did some alphabetical investigation. For two decades, this financial adviser has instructed Mainers in a holistic approach to money management. After a period of flat sales and marketing missteps, L.L. Bean is riding high again. 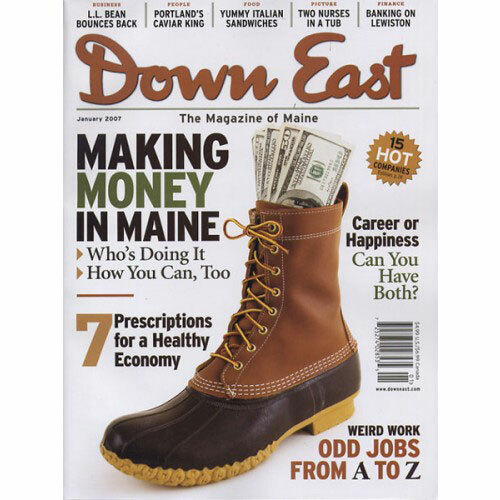 It owes its success to recapturing the mystique of Maine. Rod Mitchell, of Browne Trading in Portland, has built a seafood empire that is as far reaching as it is unlikely. Challenging times put the soul of community banking to the test. Theater The Show Must Go On “Write what you know,” they say. So it’s no wonder that British playwright Michael Frayn dreamed up Noises Off, the classic tale of an inept theater troupe’s struggle to finish its tour amidst the havoc of lovers’ quarrels, eccentric actors, and stray sardines. Jan. 23 – Feb. I wanted something in front of my house besides that awful birdfeeder my wife put up. Mainers have given John Baldacci a second chance. He’d better seize it. Two young nurses helped bring a smile to the Queen City’s patients during the 1920s.